It’s Cesarean Awareness Month (well, it was in April, but life is busy), so I’ve decided to share a few reflections on the Cesarean’s I’ve attended, the ones that have been avoided and the multitude of challenges people go through in working to give birth to their child in the medical system in in America. Devo had a C-section with her first birth. She felt so much tension in the room between family members and herself that she never really relaxed and felt safe enough to let her body open. It was probably charted as “failure to progress”. Failure is such a terrible word to start out motherhood with. No birth is a failure. When Devo was planning for her second birth, hopeful for a VBAC (Vaginal Birth After Cesarean), she had several extra challenges. 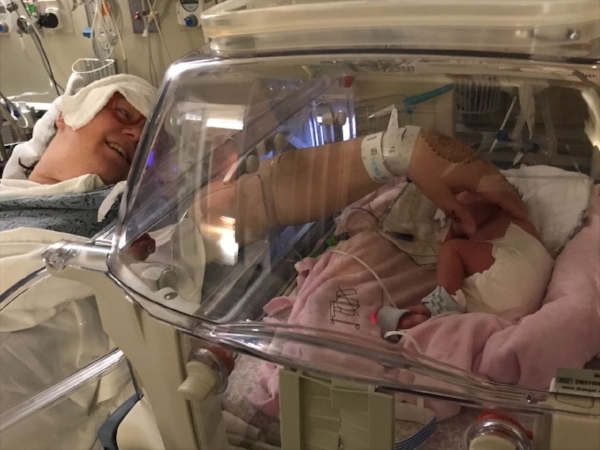 While she had a much more positive and supportive family and friends, she was also carrying twins, and the strain of growing two babies at once was so taxing on her body she was becoming increasingly ill. The babies needed to come early, and without labor— back for another C-Section, this time with very preemie babies. Despite Devo's careful planning, and doing the best she could to take of herself and grow her babies up strong, it was best for them to come sooner than hoped. We worked to get pictures of the babies from the NICU to her as soon as possible and within a few hours Devo was stable enough to visit her babies and begin to connect with them on the outside. She was so strong and brave, making difficult choices in a difficult situation. Allison contacted me when she was very early in her pregnancy, preparing for a VBAC (Vaginal Birth After Cesarean). She had joined ICAN, researched her provider options (choosing someone a 40 minute drive away) and considered exactly who was the right doula for her needs. Getting the right support was very important for Allison! She read, took classes, practiced her Hypnobirthing and did her exercises in preparation for birth. She did “everything right”. Sometimes we can do everything right and still have a messy complicated birth. When labor started Allison was doing her best to stay calm, but worried a lot about her baby tolerating labor— for good reason, as this was why she had a C-Section the first time, for fetal distress, with a run down the hall to the OR. She knew that moms and babies do best with a vaginal birth, but she didn’t want her baby in distress either. Labor was exceptionally painful for Allison and despite her original intent, she opted for an epidural at just a couple centimeters dilated. She worried that the epidural would stress the baby or stall labor. She made the best choice she could with the circumstances in front of her. Fortunately, she had patient providers, a really relaxed baby and a wonderfully supportive nurse. Even though Allison was well prepared she still had lots of doubts, as many women working towards a VBAC do. When the time came to push her baby out she found her groove. She pushed so well the doctor almost didn’t make it in the room in time for the delivery! VBACs are such a head game— so much doubt, guilt, second guessing and pressure surround the expectant parent preparing for a VBAC. I’m not one to think every person should have a doula, but I do feel that pretty much everyone planning a VBAC would do well to have one. We can help people work through the head games and hopefully find their confidence. Margaret was not ready to have a baby in her life until well into her 30s. When she was ready for a baby, she found she was one of those folks for whom getting pregnant was not so easy to pull off. She and her partner were very excited and grateful to be pregnant and expecting a baby girl. Margaret also had a baby who seemed to want to be born bottom down. We tried so many different activities- from chiropractor, to acupuncture to Spinning Babies and external version to get this little one to rotate, but no luck. With sadness, she began planning for a Cesarean birth. Margaret is a planner sort of person— she researched all of her options. Now, you would think there are not too many options for a C-section. But there can be some wiggle room, especially with the wonderfully progressive hospitals we have here in the Puget Sound area. One can ask for their choice of music in the room, the doc they prefer (when it’s a planned C-Section), to have an arm free to be able to touch the baby, to have the drape lowered at the time of birth in order to see the baby, to delay cord clamping for a few seconds (or milk the cord), to get the baby skin to skin as soon as possible, to be told about what’s happening during surgery, or to not be told, to have a warm blanket (ORs are cold), to have a doula present in addition to their partner. Margaret chose the top three things that were most important to her-- early breastfeeding, skin to skin as soon as possible and pictures of the baby being born. By advocating for the aspects she could control she felt much better when her baby's birth day arrived. There is no easy birth. A planned VBAC- with babies that come early and can’t tolerate labor; a VBAC with doubts and doubts and doubts; a planned C-section hoping to feel heard, respected and understood. As a doula, I’m helping people through the mental struggles of birth- the pain, the decisions, the doubts, the guilt people put on themselves. When I can do well, I help people feel positive about their birth. Sometimes we don’t get there for weeks or months after the birth. As much as there is no easy birth, there is also no failure in giving birth. You birth givers are all amazing and wonderful!